This quick and easy to make mix means you can get to everyone’s second-favourite part sooner (the first-favourite part, of course, is eating them)! Most waffles, especially the store bought ones, will bring forth a truly egg-y and sweetly batter. However, thanks to the various ingredients in this mix, you’ll still get parts of that familiar flavour, but you’ll also get an added flavour of something more tangy. However, this could be from my alteration of switching out the buttermilk for equal parts plain greek yogurt and water. Compared to more commercially available mixes, this mix feels and seems more grounded. The flavours appear more real on the taste buds and there is no illusion of added artificial flavouring. On the texture-front, the waffles are surprisingly fluffy. And oddly enough, they are also surprisingly dense. It is a wonder how these waffles can contain so much air and fluffiness in each but, but also can retain so much moisture and flavour in its density. Additionally, the outer crispiness is impressive, but short lived. 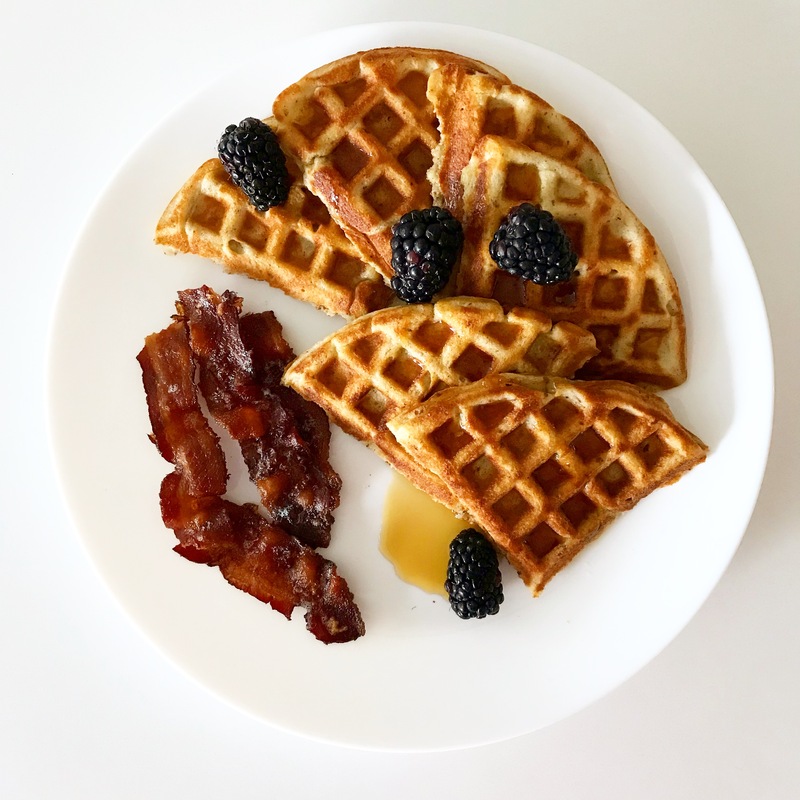 I’ll say it– I’m partial to crunchy on the outside, but fluffy on the inside type of waffles. While the crispy crunchiness was short lived, it is still enjoyable and each bite still retains some of that crunch you might look for. 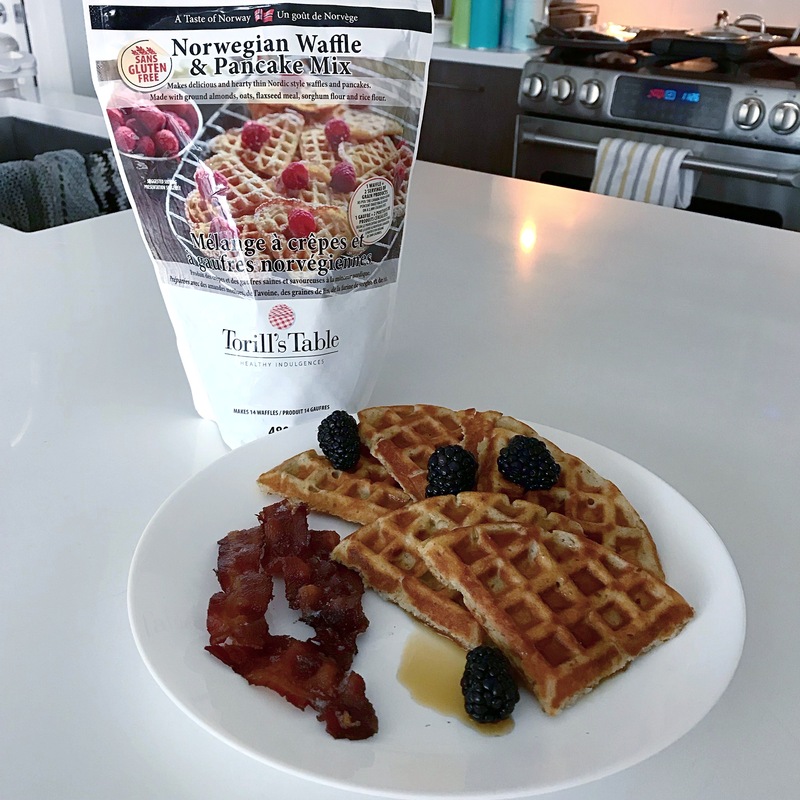 These waffles went really well with the real maple syrup, some blackberries, and of course, that crispy crispy bacon! Next time I finish off the package of waffle mix, I’ll probably try it with buttermilk, jam, whipped cream, and other fruits. This entry was posted in Recipes and tagged breakfast, gluten free, gluten free recipe, waffles. Bookmark the permalink.